Exploring "The Still Place that Lies About the Heart of Things:"
When examining the works of both George Eliot and Virginia Woolf, many critics are quick to assess the credibility and quality of characters based on how they react to the external experiences they are faced with in their imaginary worlds. However, this way of thinking serves as an injustice to both authors. Rather than finding truth in what goes on externally in these imagined worlds and judging characters’ perceptions by their relative proximity, readers should instead understand that Eliot and Woolf’s works demonstrate that subjective experience determines reality. These authors adopt similar literary strategies in order to emphasize the subjective nature of reality, but there are also notable differences between the two. For Eliot, autobiographical perspective informs her characters’ realities. Woolf employs this as well, but complicates it by presenting characters themselves as a sort of disembodied “stream” of perceptions, abandoning Aristotelian plot structure in favor of narrative strategies that more closely reflect lived or perceptual experience. Both authors also reveal the authority of personal experience (especially women’s experience) which is typically negated by patriarchal writers of history. In this way, their respective works transcend discipline-specific commentary about genre and gender to act as historical artifacts which provide visibility for women. By teasing out the political significance of women’s everyday actions, which the patriarchy has deemed mundane and unimportant, both authors argue that women’s experiences are an important reality to represent. Many feminists now are persuaded that legislation will never shake the dominance of men in private relations… Indeed, the slogan ‘the personal is political’ should be seen as a late-twentieth-century equivalent of the demonstration in nineteenth-century novels that political reform is insufficient: the power plays of home life are the foundation of the state (24). Eliot and Woolf have both delved deeply into “the power plays of home life” with their novels, exposing the profundity of private experiences that the patriarchy has historically erased. In this way and through other related strategies, the two authors have shed light on women’s experiences in a way that has caused their respective works to transcend the traditional role of the novel and cause the novel itself to act as historical artifact, uncovering the importance and power of women’s lived experiences. 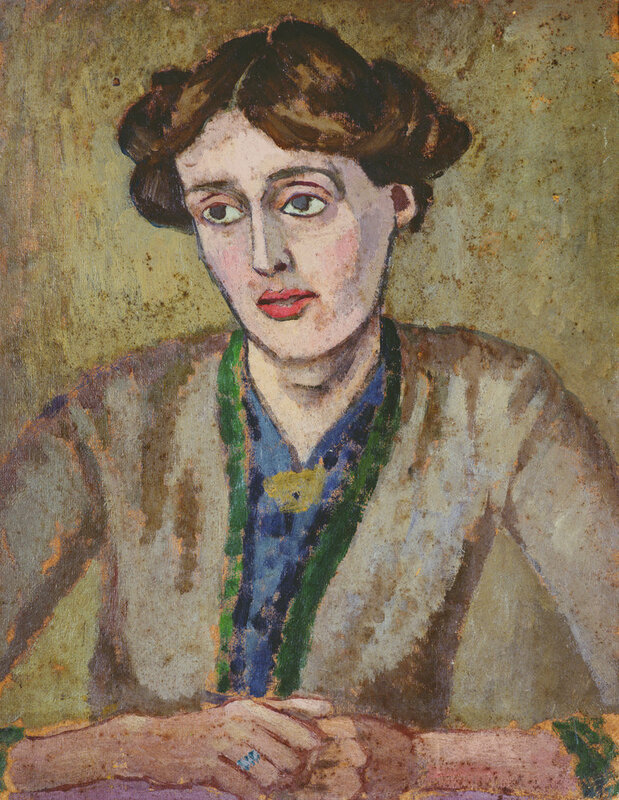 Portrait of Virgina Woolf by Roger Fry, 1917. Eliot and Woolf’s respective shaping of reality through subjective perspective, then, has much larger implications than simply providing a reading of literature. By teasing out the political significance of women’s everyday actions, which the patriarchy has deemed mundane and unimportant, the authors argue that women’s experiences are an important reality to represent. For Eliot, Woolf, and many contemporary feminists, change will not come from the top down because those at the top maintain male-centered ideas of reality that are naturally distorted. Ultimately Eliot and Woolf use their works to call attention to social inequality and promote change. This has typically been handled by historians, but Booth explains why this has been problematic. She argues that, while historians are expected to be intellectually unbiased, this is an impossibility. However, she says that “it is difficult to combat bias, for example the bias of traditional history against the detail of women’s lives, except on the grounds of a nearer approach to objective truth” (85). Because historical study is so deeply rooted in patriarchal ideals, it is biased against women’s authentic experiences. A feminist perspective on history is not more viable because it is unbiased, but because it “is less distorted than theirs; feminist history includes more – such at least is the unspoken motive for most feminist scholarship” (85). Woolf and Eliot’s respective novels provide evidence of the inclusiveness of feminist history, because they have such a focus on the common life. Thus, their works are inherently more politically powerful than patriarchal histories because they tell us more about women’s largely invisible lives. Both Eliot and Woolf's works call to attention the significance of everyday occurrences and internal subjectivity to uncover what has been erased during the patriarchal writing of history. It may be contended that Eliot and Woolf’s works do not have any historical weight because fiction and history are separate genres. However, one must only consider the aforementioned patriarchal power structure behind historical writing to understand why the novel can and must serve as a historical artifact in defiance of that hierarchy. History is non-inclusive of women’s stories largely because women have traditionally not been allowed to engage in writing history. Women, then, have been forced to find other ways to call attention to the significance of their experiences. In A Room of One’s Own, Woolf emphasizes the fact that, despite culturally enforced limitations, women need to (and have) found ways to express the profundity of their experiences: “Women have sat indoors all these millions of years, so that by this time the very walls are permeated by their creative force, which has, indeed, so overcharged the capacity of bricks and mortar that it must needs harness itself to pens and brushes and business and politics.” (n. pg.) The novel form has customarily been more of an acceptable mode of writing for women (and even this has been a tough battle for women to win, as evidenced by George Eliot’s masculine pseudonym) than has “non-fiction” types of writing. Consequently, works such as Eliot and Woolf's that call to attention the significance of everyday occurrences and internal subjectivity uncover what has been erased during the patriarchal writing of history. To be sure, because Woolf and Eliot’s works serve to unearth the political power of women’s personal lives, their female characters read as ethically-motivated heroines. In his analysis of the subject, James Sloan Allen compares Clarissa to Eliot’s Dorothea Brooke in Middlemarch, and cites Eliot’s final words in the novel which he says suits both of those characters: “The growing good of the world is partly dependent on unhistoric acts, and that things are not so ill with you and me is half owing to the number who have lived faithfully a hidden life and rest in unvisited tombs” (589). Here, Allen is echoing Booth’s argument that both Woolf and Eliot reveal the significance of the hidden life of women – that which has been ignored by history. But Allen’s argument ultimately has a narrower focus, albeit one that radically questions the value given to women’s “trivial” concerns. He defends Clarissa’s focus on parties (an “unhistoric act”) as evidence of her important social role. Allen mentions that critics condemn this behavior in Clarissa, as do Clarissa’s male counterparts in the novel. Of her incessant party-planning around which the novel centers, Mr. Dalloway says, “It was a very odd thing how much Clarissa minded about her parties” (119). Clarissa’s former lover, Peter Walsh, also scoffs: “’Oh these parties, he thought. Clarissa’s parties. Why does she give these parties?’” How “’she frittered her time away,’ he goes on, ‘lunching, dining, giving these incessant parties’” (48). Patriarchal power structures are very apparent here. Richard Dalloway and Peter Walsh are both powerful men of relatively high social status, and thus they are definitely members of the party responsible for writing history. It only makes sense, then, that they would regard Clarissa’s party planning as frivolous and unimportant. “Every element in her party has underlying political reading and significance. Otherwise the Prime Minister’s presence would be odd. …Other characters reinforce this view too: Richard Dalloway is a successful politician. Peter Walsh, a colonial (Indian) administrator. …Sir William Bradshaw is an ambitious, self-centered psychiatrist who cares only for the power that his occupation gives him, power to manipulate the lives of others, power to intrude, to meddle, to interfere” (294). Despite the criticisms leveled against Clarissa’s preoccupation with hosting parties, it is clear that her parties are humanistically motivated and politically significant. Allen points out the feelings of vulnerability and tragedy toward which Clarissa is prone, reminding us that she is a person who finds it “very, very dangerous to live even one day” (592). In spite of this, Clarissa finds delight in her everyday experience: “What she liked was simply life. ‘That’s what I do it for,’ she said, speaking aloud, to life” (592). We can infer based on Booth and Sloan’s arguments that Clarissa’s motivations are not simply self-serving and frivolous. The fact that her party is a manifestation of the joy she takes in her own life points to something more ethically and politically significant in Clarissa. Allen focuses on Clarissa’s desire to bring people together, citing the following quote from the novel: “Here was So-and-So in South Kensington; someone up in Bayswater; and somebody else, say, in Mayfair. And she felt quite continuously a sense of their existence; and she felt what a waste; …She felt if only they could be brought together; so she did it” (592). Clarissa has the sense that humanity is scattered and can benefit from being brought together, so she accomplishes this through her parties. Although members of the patriarchy (both in the novel and in the real world) may consider party planning a frivolous women’s activity by members of the patriarchy, Clarissa’s motives prove that it is actually a humanitarian effort. Clarissa’s role as a woman within the patriarchal structure would typically not be considered politically powerful. However, her parties give her the political power she would otherwise lack. She has carefully orchestrated a situation that not only brings together a “scattered” community of people, but she is the central figure in an arrangement of politically important people. As Montashery writes: “Clarissa finely demonstrates power relations in the party. Although power is always associated firmly with the male and masculinity, here it is Clarissa who tips the balance in her favour to be the most powerful figure in this political party” (294). In an act of what the patriarchy regards as feminine frivolousness, Clarissa is actually establishing her own political power. This act forwards an argument for the power of women’s experiences as a whole. Allen, James Sloan. ""Mrs. Dalloway and the Ethics of Civility". "Sewanee Review. 107.4 (1999): 586-594. Print. Booth, Allison. Greatness Engendered: George Eliot and Virginia Woolf. Ithaca and London: Cornell University Press, 1992. Print. Cox, C.B. The Free Spirit: A Study of Liberal Humanism in the Novels of George Eliot, Henry James, E.M. Forster, Virginia Woolf, and Angus Wilson. New York and Toronto: Oxford University Press, 1963. 13-37, 103-116. Print. Eliot, George.The Lifted Veil. 1859. New York: Oxford University Press, 1999. Print. Flint, Kate. "Blood, Bodies, and The Lifted Veil. "Nineteenth-Century Literature. 51.4 (1997): 455-473. Web. 13 Dec. 2012. Mezei, Kathy. Ambiguous Discourse: Feminist Narratology and British Women Writers. The University of North Carolina Press, 1996. Print. Montashery, Iraj. "A Multidisciplinary Approach for the Construction of Subjectivity in Virginia Woolf's Mrs. Dalloway. "Advances in Asian Social Science. 1.3 (2012): 293-300. Print. Rachman, Shalom. "Clarissa's Attic: Virginia Woolf's Mrs. Dalloway Reconstructed. "Twentieth Century Literature. 18.1 (1972): 3-18. Web. 8 Dec. 2013. Smith, Susan Bennett. "Reinventing Grief Work: Virginia Woolf's Feminist Representations of Mourning in Mrs. Dalloway and To the Lighthouse. "Twentieth Century Literature. 41.4 (1995): 310-327. Web. 8 Dec. 2013. Wood, Jane. Passion and Pathology in Victorian Fiction. Oxford University Press, 2001. Print. Emily Caliendo graduated in 2014 with a Bachelors degree in English Secondary Education from Saint Xavier University in Chicago, IL.